Communist guerrillas grew stronger last year after a long period of battle losses, acquiring more fighters and guns and killing more government forces in a spike of attacks, a Philippine government report says ahead of renewed peace talks. Government and rebel negotiators are to resume talks stalled for more than six years, on Tuesday in Norway. Both sides have declared a weeklong cease-fire to bolster the negotiations aimed at ending one of Asia's longest-running Marxist insurgencies. Government negotiators have expressed hope that last year's election of reformist President Benigno Aquino III on the promise he would reduce poverty and improve governance would soften the rural-based insurgency, which has survived decades of military crackdown. A confidential government threat assessment report, however, said the guerrillas managed to recover last year from a decline dealt by battle losses since 2002 with its fighters increasing by 30 to 4,398 and firearms rising by more than 130 in just a year to 4,871. The rebels managed to re-establish six rural strongholds that had been overrun by the military and staged 413 attacks — 11 percent more than in 2009. Security personnel killed by the rebels rose by nearly 9 percent to 172, including 102 soldiers, due to improved guerrilla capability to make bombs used in ambushes, according to the report. A copy was obtained by The Associated Press. "Despite what many consider its anachronistic ideology, the insurgency has endured," the Brussels-based International Crisis Group said. "Many of its criticisms of income inequality, human rights abuses and broader social injustice still resonate with some Filipinos." The report said government forces killed 35 rebels last year and captured 131 others while more than 150 surrendered. Military chief of staff Gen. Ricardo David Jr. said army troops and police captured Allan Jazmines, a member of the policy-making central committee of the Communist Party of the Philippines, at a rebel safehouse in Baliuag town in Bulacan province before nightfall Monday. The rebels protested the arrest and demanded his immediate and unconditional release "so that there will be no disruption of the formal peace talks." Chief rebel negotiator Luis Jalandoni said in a statement that Jazmines is among guerrilla consultants to the talks covered by a government immunity from arrests and prosecution amid the negotiations. The military has said that it was willing to release Jazmines if he was covered by the government immunity. David said without elaborating that the arrest of Jazmines, shortly before a cease-fire came into force, was a setback to the Maoist rebels' "organizing, deception and propaganda efforts, adding "arrests of this kind will continue." 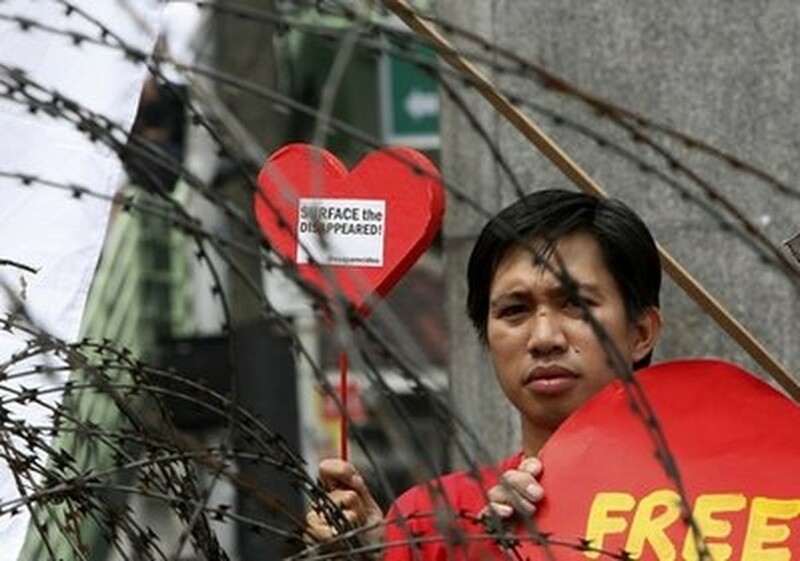 Jazmines was captured twice during the reign of dictator Ferdinand Marcos and was among communist leaders who were freed when President Corazon Aquino took power following a 1986 "people power" revolt that toppled the strongman, said Satur Ocampo, a former rebel spokesman and negotiator. Both sides imposed a weeklong cease-fire that began Tuesday to foster the negotiations, which stalled in 2004 after the Maoist rebels accused then President Gloria Macapagal Arroyo's government of instigating the inclusion of the communist party and its armed wing, the New People's Army, in U.S. and European terrorist blacklists. It was the first time since on-and-off talks started 25 years ago that the rebels have agreed to a cease-fire while negotiations are being held.